It is a pleasure to let you know that our next seminar is scheduled on June 5, 2018 at 10.15 a.m., during which prof. dr hab. Andrzej Góźdź will give his talk entitled „Afiniczne kwantowanie osobliwości w czasoprzestrzeni (scenariusz BKL)"
It is a pleasure to let you know that our next seminar is scheduled on May 15, 2018 at 10.15 a.m., during which prof. dr hab. 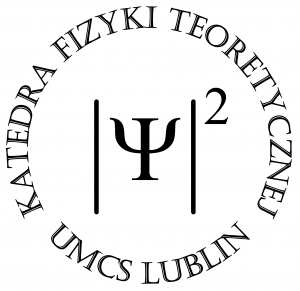 Jerzy Kozicki (Institute of Mathematics, UMCS) will give his talk entitled " Phase transitions "
It is a pleasure to let you know that our next seminar is scheduled on May 8, 2018 at 10.15 a.m., during which prof. Grzegorz Michałek (Astronomical Observatory of the Jagiellonian University) will give his talk entitled "Periodic oscillations in LASCO coronal mass ejection speeds "
Prof. Bogdan Bułka (Institute of Molecular Physics, Polish Academy of Sciences, Poznań) "Full Counting Statistics in Transport through Quantum Dots"